I’ll be talking collaboration, animation and illustration with the mighty Ant Sang at WORD Christchurch 2018. Best known for his Dharma Punks comics, the award-winning graphic novel Shaolin Burning and his work on the ground-breaking animated television series, bro’Town, Ant Sang brings to WORD his latest work, a collaboration with author Michael Bennett. 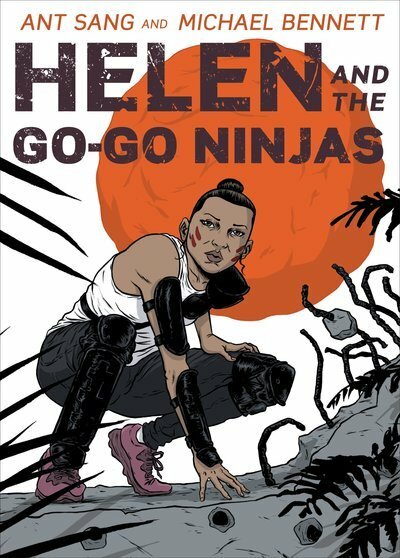 Helen and the Go-Go Ninjas follows the adventure of a young woman kidnapped by time-travelling ninjas, and thrust into the year 2355. In a ruined future Auckland she negotiates roving gangs and giant humming devices that enslave and control people’s minds. Sang talks collaboration, animation and illustration with comics fan Tracy Farr. For more information about this event, and to purchase tickets, view event details on the WORD website. Better still, check out the full WORD Christchurch 2018 programme, and book for Ant Sang: Dharma Punk when you book for everything else you’re bound to want to attend. You can also catch me MC’ing Bad Diaries Salon: #Risk on Friday night at WORD.